Bloomberg has a great story on differences in the pay of different central bank governors within the euro area. 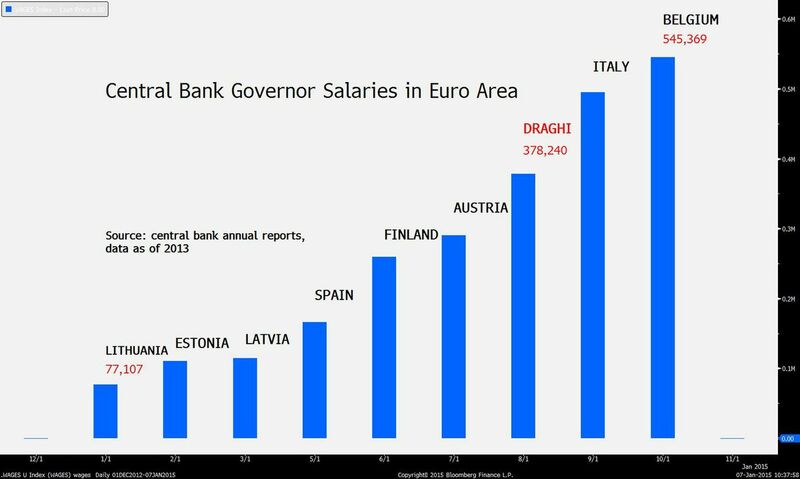 As the graph illustrates there is a massive difference between how much the different euro zone central bank governors are paid. These differences probably very well reflect the general differences in income levels within the euro area. Normally we would say that a core condition for being a “Optimal Currency Area” is that the income (productivity) level of different countries/regions within the currency area should be on a fairly similar level. The pay differences of euro zone central bankers illustrates quite well that this core condition is not fulfilled within the euro area. You should run into the same problems in the U.S. if difference in income levels is a problem. There is a large discrepancy in income levels between the South and the Northeast. However, it doesn’t seem to cause any problems here. The South doesn’t have the structural problems that trouble a lot of the low income countries in Europe though.